People came over for Halloween. Most dressed up. It was fun! Mom and Carrie making pasta for Christmas Eve dinner. Mom and me with the pasta maker! The meatballs and pasta sauce. 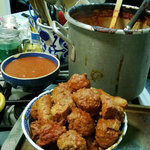 I helped make the meatballs, and not to brag, but they were delicious! 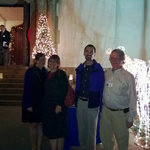 The family just before midnight mass. It was cold! A cool "ferris wheel" a coworker made with magnets and tangram cards.